Wine tasting in our courtyard, hosted by Gilded Grape Winery, is very popular on Third Thursday. This event, featuring art, music, shopping, and food, is sponsored by the Downtown Merchants Association, and takes place on the third Thursday of every month, from 5-8 pm. Shops and galleries are open for browsing, and local musicians will entertain you. Enjoy the evening by taking a pleasant stroll with friends through historic downtown Punta Gorda, browse shops and galleries, and then stop in at one of our many fine restaurants for a leisurely meal. Sea Grape Gallery will be ready to welcome you with complimentary refreshments, including wine tastings by Gilded Grape Winery, and artist demonstrations. Our artists are always available to assist you, and to discuss their artwork and techniques. “Alive After 5” is now “Third Thursday – Wine Walk.” Next Wine Walk: May 16th 5-8 pm. In order to bring something new and fresh to Third Thursday, the Downtown Merchants will be presenting “Wine Walk.” To participate in the Wine Walk, you need to purchase a $10 ticket from the PG Chamber office located at 252 W. Marion Avenue prior to the event, or else from a table in front of the Chamber on the night of the event. This ticket will be accompanied by a map of all participating merchants, where you’ll be offered a wine sampling at each venue. Visit some or all of our participating merchants, and enjoy a different wine varietal in each location, while enjoying what each store has to offer. Participating restaurants will be offering wine specials as part of the event. 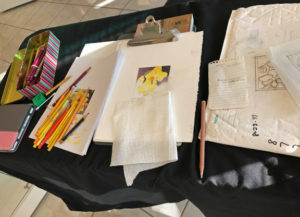 Artist demonstrations are popular on Third Thursday, and visitors love to see how our artists create their works of art. 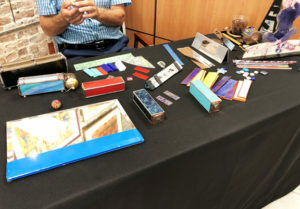 At April’s event, Bob Rioux explained the process of creating a stained glass kaleidoscope, and Anne Tuttle demonstrated colored pencil painting techniques.